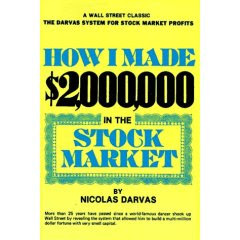 How I Made 2 Million in the Stock Market is a first hand account of how Nicolas Darvas made $2,000,000 dollars in the stock market in the space of about 2 years. Nicolas Darvas chronicles how he got involved in stock trading from losing money on rumours and bad advice to the formulation of his famous Darvas Box Theory and the accumulation of more than $2,000,000 in less than two years. Darvas tells how he patiently stalked the stock market for stocks that triggered his buying conditions. And, how once a stock was bought it would be sold automatically by a stop loss or kept no matter what until it changed direction or stabalized for some time. Probably the most valuble lesson the trader can take from this book is the importance of a Trading Plan. The reader is told how Darvas formulated his theories, observations and lessons from his losses into a concrete Trading Plan and how he carried it out - sometimes waiting weeks for the right trade. Also, using the plan to resist the temptation of profit taking early and missing out on large winnings. Another lesson the trader can learn from Darvas is how crucial it is to learn from mistakes and to use these lessons to shape your goals to achieve success. The book itself is an extremely easy read. Don’t be put of by the somewhat cheesy title either. Even if you do not trade the book would be entertaining, and if you do, it would possibly be the cheapest $10 of advice you could receive about this business.